The International Association of Business Communicators (IABC) – Barbados Chapter, welcomed a new Board of Directors for the 2017-2018 term. The Chapter has announced the appointment of Deborah Stoute as President. In articulating her vision for the IABC Barbados Chapter over the next year and well into the future, Stoute stressed the need for a resurgence of interest in active membership and participation in the work of the Chapter; the recognition that the IABC Barbados Chapter deserves as a professional body; opportunities for communications professionals for certification and professional advancement as strategic advisors; the importance of members engaging in corporate social responsibility programmes; the desire for communications professionals to work together and take their place amongst other professional bodies and demonstrate that there is no need for organisations operating in Barbados to go outside of Barbados to find capable, qualified communications professionals; and the desire that in time, IABC Barbados will become the type of organisation that can have a functioning secretariat through which it can be represented as a body at the annual IABC World Conference by a team of professionals proudly representing Barbados. In her address as incoming President, Stoute also noted that it is also her wish that “Barbados could lay claim to more Gold Quill winners”. 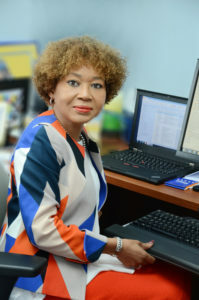 She added that more than anything, she wishes that when we encounter other communications professionals in Barbados that we can say to them, “why aren’t you a member of IABC”. Stoute’s executive team for the next year includes Sara Odle of Virgo Communications – Senior Delegate; Tracy Moses, Senior Marketing Communications Officer Nation Group – VP Finance; Carmel Haynes, Principal, Haynes Consulting – VP Professional Development; Samantha Hazlewood, Communications and Administrative Coordinator, Profiles Caribbean – VP Membership; Xavier Jeffrey, Product Lead, Flow Barbados – VP Marketing and Communications; Carol Walcott, Senior Associate, Internal Communications PwC – VP Administration. Fay Cooke-Nurse, Public Relations and Media Relations Consultant and Principal of Millennium Communications will serve on the Executive as President Elect. The IABC Barbados Chapter has before it a plan for its quarterly professional development seminars, networking opportunities for membership, greater social media engagement, a renewed membership initiative, a structured corporate social responsibility programme to include its highly regarded Gift of Communication and a review of its by-laws with a view to extending the service of its executive to two years rather than the current one year of service.